Our annual Holiday Card Workshop is approaching! The event will be held on the 6th and 7th of December, both days from 1-5 pm. The cost is $10.00 and will be hosted by faculty and students in the Book Arts Center. 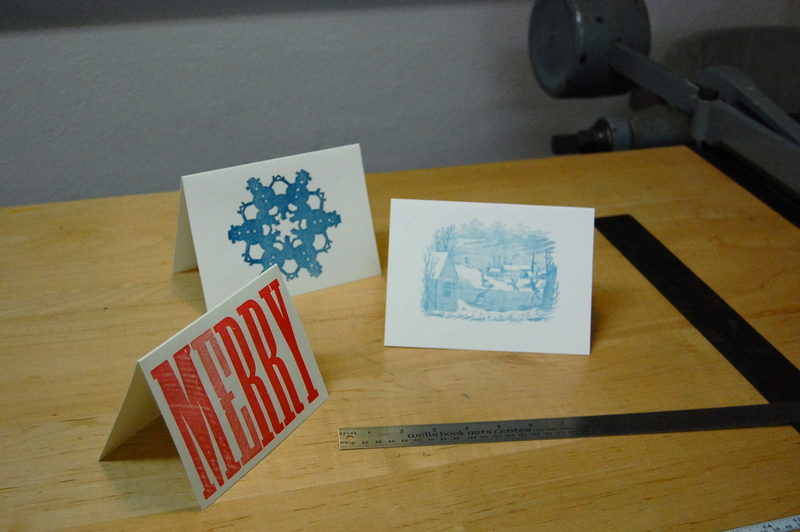 Participants will letterpress print 6 holiday-themed cards on our Vandercook presses. We will have cookies, hot chocolate, and holiday music for a festive atmosphere! We will also hold a holiday sale including blank books, prints, and additional cards. We’d love for you to join us in Morgan Hall on the first floor. Please indicate your interest or any questions by sending a contact form below. This entry was posted in Uncategorized and tagged book arts, Card, Event, Holiday, letterpress, printing, vandercook, wells by wellsbookartscenter. Bookmark the permalink.